I recently completed the 'Artitec' Spoorpont Ferry model, for use on my Monks Island Railway. I had been pursuing this kit for a considerable time and was pleased that 'Langley Model Works' had it in stock. BTW: Don't be 'put off' with ordering from vendors in the U.K. ... they are wonderful and ship 'across the pond' quickly. 'Artitec' kits (from Holland) are not intended for anything less than an experienced modeler. They are constructed of resin-castings with lots of tiny brass bits. 'Artitec' kits are advertised as being appropriate for OO & HO scales (1:76 and 1:87). ... with the builder left with figuring out where things are to be placed. OK, so the kit is now complete (and looks great) ... 'time put on some 40' boxcars. ... then no more progress is possible, the stanchions are too narrow for the cars to pass. Additionally, a standard 40' boxcar BARELY passes by the wheel house cab. (American cars, in addition to being wider, are higher than their European counterparts. The point to all this is to be wary of using European kits with [larger] American rolling stock. While HO is 1:87 and OO is a bit larger (in scale), the actual cars are vastly different in size. ... make sure your rolling stock will fit. BTW: I don't know how one can determine this beforehand - as no assistance is rendered by the manufacturer or seller. "Keeping my hand on the throttle, and my eyes on the rail." Howdy Ray, I would love to see some photos if possible. 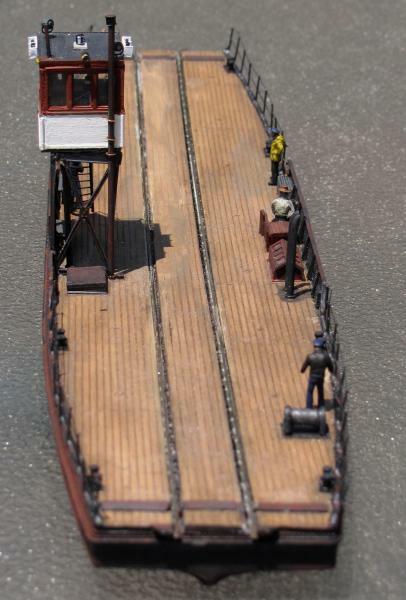 It has been requested that I show some images of my Spoorpont Ferry model. Please understand that the model is not fully completed (or weathered). My comments are not meant to condem 'Artitec' - nor their line of fine models. I am merely trying to point out some problems when 'mating' European models to American rolling stock. In this first view, one can see the ferry with two American 40' cars on deck. I wanted to show how nicely this model 'fits the scene'. Don't be fooled, while the cars seem to fit on the ferry's deck, they cannot fit through the end gates and stanchions. For the next series of images I will remove any rolling stock and take the ferry out to our backyard harbor. BTW: With a different color underneath that glass really looks like a harbor surface. This is how the ferry looks today (all hand rails are in place and the crew is aboard). ... They are very thin black thread, that requires the modeler to drill out (slightly) each tiny hole in the railing stanchions). The crew seems to be in a state of readiness ... must be coming into the slip. Well, there you have it: an excellent model; that doesn't do the job. I have been advised, by my U.K. pen-pals, that modification of the wheel house would allow more clearance. I am not sure that is what I want to do. I may just order some vans and wagons from E. Hatton's and display it. As in all things, you never know. I do know that the Monks Island Railway 2.0 will require something better (as a ferry) than the extended Peco Loco-Lift it now uses. Ironically, the worst-looking thing to represent water in scale is ... water. Jose. I know...that's another thing that killed my plans...unrealistic water. I think Woodie has hit on yet another problem with expanses of water ... they tend to be unrealisitc. Some time ago I visited a fellow hobbyist's layout wherein he had a very nice harbor scene. The 'water' looked OK - and was certainly superior to anything I had attempted. My host's comment was [sic]; " The amount of effort, involved with the water, was not worth the trouble "
Furthermore, " It is almost impossible to keep dust free! " Hmmm, when was the last time you saw dusty water in a real harbor? Many modelers ('modellers' for you European readers) in the U.K. use 'wavy' Lucite shower door 'glass' as the 'water' in larger expanses. I had filed that tidbit away and, after re-viewing the pictures above, am thinking they may be onto something. there is a striking resemblance to water with the 'rippled' glass. One could use the 'smooth side' of the glass up for ease of cleaning; or turn it over ('ripple side' up) to show water surface definition. and the 'waves' would accentuate the idea that the hull was immersed within the medium. Really all that seems needed, is an appropriate, painted surface under the Lucite. 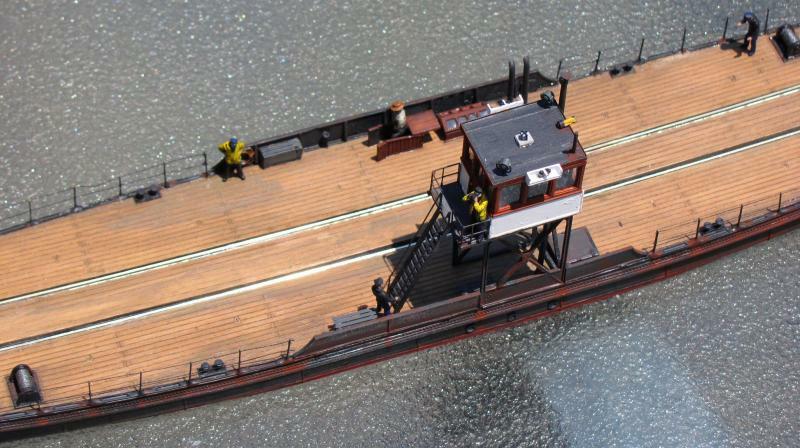 CNE Runner wrote: I recently completed the 'Artitec' Spoorpont Ferry model, for use on my Monks Island Railway. I just ordered this from Langley. I agree, I’ve ordered plenty of items from vendors in the U.K. and have never had any problems. Standard post may take a while but I’ve never had an issue. I am planning the height of my car float apron. Could you please tell me the height to the top of the rails so I know how high to make the dock with respect to the surface of the water? It would allow me to set the water height while I’m waiting and would be greatly appreciated. Wow...I haven't visited this forum in quite awhile. It is always nice to hear from a fellow modeler. OK, you ordered the Artitec ferry kit from Langley? You will have no problems with Langley - nor shipping from the UK. I have ordered from several UK-based companies and have never had an issue with any of them. 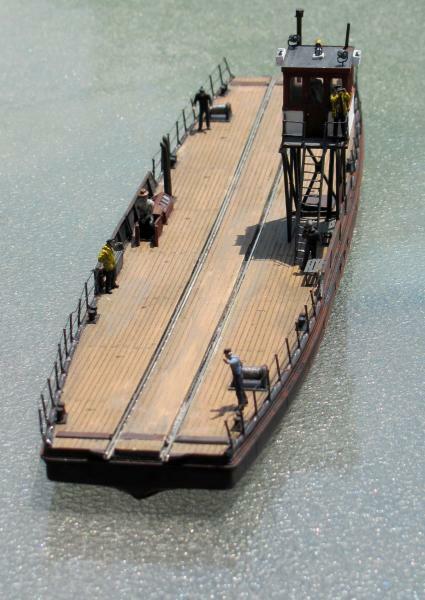 The Artitec Spoorpont Ferry is not a kit for the rank beginner. I will assume you are familiar with resin kits. The kit is designed (sized really) for European rolling stock. European rolling stock tends to be significantly narrower than the U.S. variety. 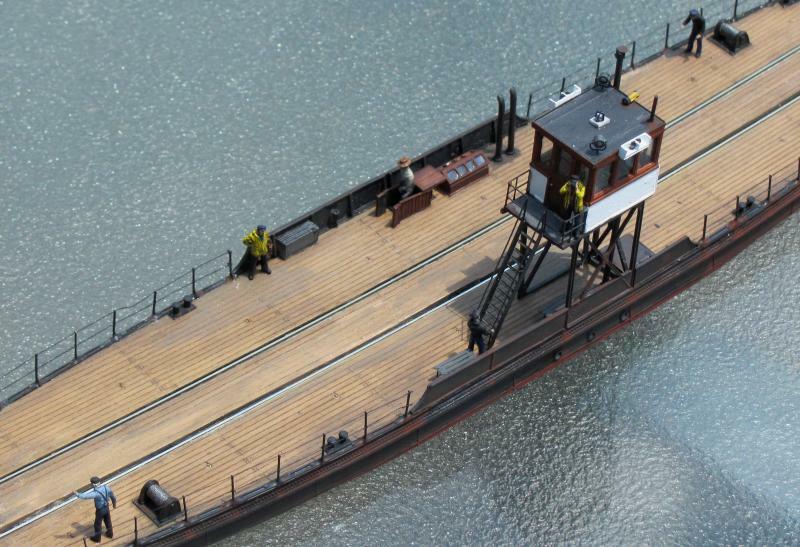 As built, U.S. boxcars (for example) will not pass by the wheelhouse. 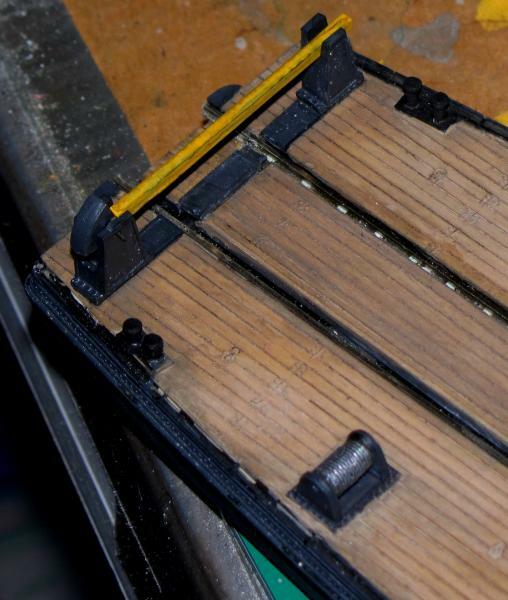 I had to scratchbuild a wheelhouse support structure - using the kit's wheelhouse cab only. By design, the ferry has a considerable amount of sheer. [Sheer is the term used to designate the curve or sweep of the deck of a vessel as viewed from the side.] This means that the deck is higher at the stern and bow than it is in the center. So what? Well, matching an apron to a vessel with considerable sheer can be daunting. I elected to elevate the stern of my ferry to alleviate this problem...but did create others such as rolling stock wanting to roll off the ferry. If you do not account for this sheer, you will end up with a 'hump' where the ferry's rails meet the rails of the apron. Ferries, such Walthers for example, have flat decks (little/no sheer) and wider beams...usually there is no wheelhouse as they are designed as non-powered barges. The ferry will only hold roughly 2-40' cars. The Monks Island Railway & Navigation Co. only ships 2 cars at a crossing (there are 2 crossings per day) so it isn't a problem. The Artitec ferry makes a great model. It is both time-consuming and challenging. Am I glad I built this particular model? Yes. Unfortunately there are very few standard gauge ferry kits available (there are some really nice narrow gauge kits out there). I wish you much success with the kit and would be interested in knowing how it came out. Please excuse the lack of pictures as I forgot how to include them on this forum.